Elon Musk issued yet another incredibly ambitious timeline. During a Q&A at the SXSW festival on Sunday, Musk said SpaceX will be ready to fly its Mars rocket in 2019. "We are building the first ship, or interplanetary ship, right now," Musk said. "And we'll probably be able to do short flights, short up and down flights, during the first half of next year." Musk said last year that his Mas rocket, called BFR or Big Falcon Rocket, could one day fly people from city to city on Earth in incredibly short time spans, touting that it would take 30 minutes to hop from New York to Shanghai. He said at the time that he hopes a BFR will land on Mars in 2022, and the first missions will send cargo. Eventually, the rocket will host convoys of people and their belongings. The ultimate goal is to establish a self-sustaining colony on the Red Planet. 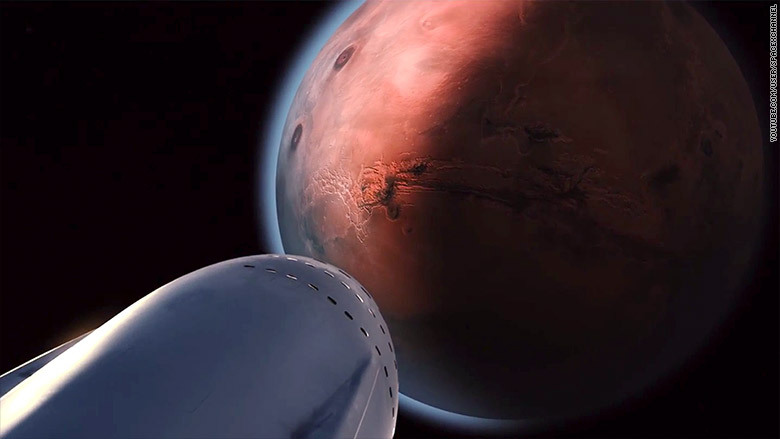 Sending humans to live on Mars is at the heart of Musk's vision for SpaceX. It's prompted the internet to bestow Musk with the nickname "God-Emperor of Mars." The billionaire entrepreneur has always denied that he wants to rule the planet, and on Saturday he detailed his vision for a direct democracy in which "people vote directly on issues instead of going through representative government." "Maybe it requires 60% [majority vote] to get a law in place, but any number over 40% can remove a law," Musk said. It should be "easier to get rid of a rule than to put one in." The text of the laws should be short and easy to understand, he added. According to Musk, too many regulations can be harmful and keep a society from moving forward. It leads to a "hardening of the artery of the civilization," he said. Musk also said earlier in the event that colonizing Mars will present huge "entrepreneurial opportunity." "Mars will need everything from iron foundries to pizza joints," he said. "Mars should really have great bars...A Mars bar," he said to laughs. The billionaire CEO of SpaceX and Tesla is known for underestimating how long his major endeavors will take. The company's Falcon Heavy rocket, which enjoyed a historic inaugural launch last month, was initially promised a 2013 debut. Musk admitted as much about his habit of blowing through deadlines with a sarcastic comment from the SXSW stage. "People have told me that my timelines historically have been 'optimistic,'" he said. "I'm trying to 'recalibrate' to some degree here."